Melissa was 41 and the mother of 13 children. Please keep her, her husband Tom, and her children in your prayers. Inside church this past week, we were wreathed with lilies, Easter Alleluias ringing in our ears. Thus we sung a Solemn High Mass for Lady Day, the Annunciation of the Blessed Virgin Mary. A few hours of precious Eucharistic Adoration followed, our school and our priests taking turns before the monstrance. Vespers, the daily closing thanksgiving prayer, concluded our “miniday”, the children chanting the Psalms of David alternately with the clergy, the children the beautiful Ave Maris Stella. Our mini First Friday also featured two hours of adoration. One member of the Guard of Honor took his post at the kneeler, representing all. Attendance for both Masses and Exposition was not bad, considering that Lent is past, and Spring is pressing itself upon us, drawing us away from weekday Masses. Balmy winds have blown in the full bloom of Spring in West Chester. The rapidly greening grass is dotted with jubilant yellow from forsythia and daffodil, narcissus and “lions’ teeth” (dandelions). My weeping cherry tree is a magnificent bride’s corsage of white, but only for a little while. Robins and rabbits rule the roost, warily watched by the cat Caravaggio, eternally biding his time. Coyotes are heard no more, though deer still draw near at dawn or dusk to eat something they shouldn’t. The one remaining groundhog keeps a prudent distance for now. †Melissa Kunkel died suddenly on First Friday, leaving her husband Tom and a dozen children. Her wake was so sad a gathering as we prayed and offered our condolences to the bereaved family. Please do keep the deceased and her family in your prayers. May God protect and provide for them. Today we honor the Good Shepherd, and pray fervently for lost sheep. Every “leaving” takes a toll in hidden lost souls. Wednesday’s Solemn Mass goes to good St. Joseph, Patron of the Catholic Church. Next Sunday we will all keep his solemnity. We are not alone; Jesus and Joseph are looking out for us. Let us look to them with Mary for every grace we need, and the finding of our dear lost souls. All morning, as if on cue, a robin has been singing outside my window, accompanying my prayers and writing. Speaking of cues and writing, it is probably time I end this. Fr. Cekada dryly remarked the other day upon the expansion of my Bishop’s Corner, suggesting I provide an Executive Summary at the top. 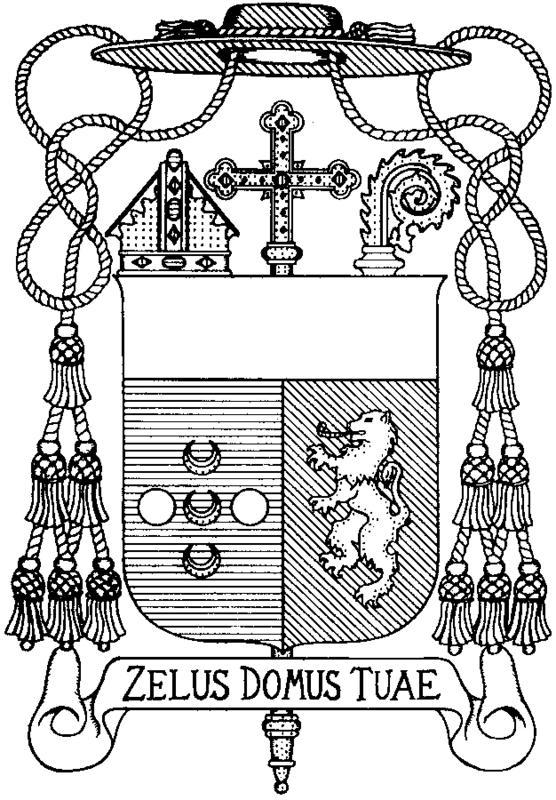 Well, it is true that the Bishop’s Corner has become the Pontifical Page, but it seems good to stay in touch this way. Thank you for your feedback. I am happy that many read not only this page but the prayers and poetry and meditations as well. See you Wednesday to honor St. Joseph. The Good Shepherd keep you for one of His own. This entry was posted on Saturday, April 13th, 2013 at 9:09 pm	and is filed under Announcements.